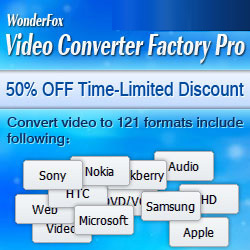 March 3, 2014 – WonderFox Soft, a leading developer of Windows multimedia applications who makes better solution to ease digital life, today has upgraded its acclaimed DVD Video Converter to new version - v6.2. This upgraded version enables quick and easy conversion to the format WEBM, TRP, F4V and Vimeo. It well supports the latest portable devices, like Nokia Lumia 2520, Lumia 1520, Sony Xperia Z1S and Kindle Fire that just hit the market. The converter also provides optimized presets for almost all TVs: LG TV, Sony TV, Samsung TV, Panasonic TV, Toshiba TV and more to make video be best viewed on TVs. If you have a great amount of DVDs, WonderFox DVD Video Converter is a big help for you to backup any encrypted DVDs including with DVD CSS, region code, RCE, Sony ArccOS, UOPs, Disney X-project DRM and the latest encrypt technology. DECSS technology is continuously updated to handle new protected DVDs. User can change audio and video parameters when it comes to the resolution, encoder, aspect ratio, bit rate, frame rate, norm, channels, volume and sample frequency rate. WonderFox DVD Video Converter can automatically read information of source files and set the optimized settings for output. So, all you have to do is specify the output profile and destination, in order to initiate the encoding process. Furthermore, you can preview clips and take snapshots, view file information, set post-task actions (e.g. exit program, shut down computer) and the thread priority, specify the snapshot format and directory. 1. Well support backing up DVD disc, DVD folder, ISO file with the latest encryption technology. 2. Import all popular formats and convert DVD/video to more than 100+ video formats for output. 3. Download online videos from YouTube, Facebook, Vimeo, Liveleak, metacafe and other popular online video sources. 4. Support basic editing functions -easily Merge, Clip, Crop Video and Add Special Effects. The trial version allows you to work with videos of 15 minutes or less length. There are no watermarks and no expiration for the free trial. The only limitation is the max length of 15 minutes for the videos. If you have longer videos, you will need to upgrade to the premium version, which is regularly priced at $19.95.